Your clutter-free garage is just a storage cabinet away. But with so many cabinets from free-standing to wall-mounted you may not know where to start. In this guide I’ll cover the best storage cabinets that can stand the temps in any garage while keeping your knick-knacks safe and tucked away. To dig into this post you can use the table of contents below. Or you can browse through all the various cabinets listed here to see what they can offer your garage. Storage solutions vary greatly based on what you’re storing and how much space you need. Large plastic shelving may be more appropriate for a garage with an empty wall and lots of stuff to stow away. But if you have little-to-no floor space then wall-mounted shelves might be better. There isn’t really a one-size-fits-all choice when it comes to shelving. You’ll need to consider what you need and make your decisions around that. Do you have lots of tools that need a firm cabinet? Or are you looking to store extra towels and silverware in the garage? You’ll also need to consider how much setup is required. Are you okay spending a few hours securing and mounting cabinets to the wall? Or would you rather buy a simple plastic shelving unit that only takes 20-30 minutes to setup? Nobody can answer these questions except you. They change for each situation and you might even want many different storage cabinets in one garage. 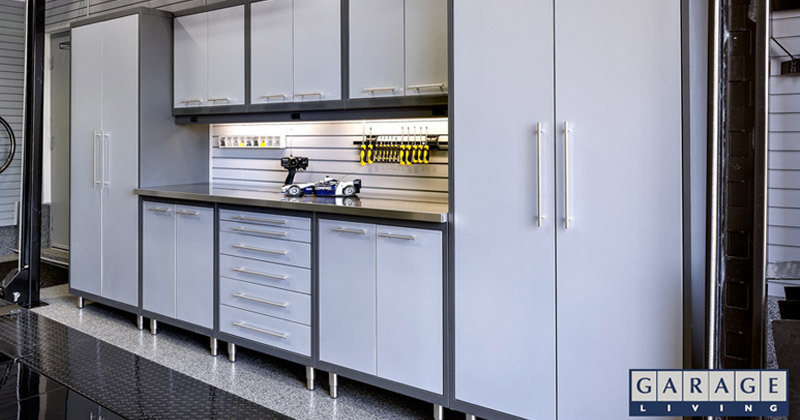 This guide covers all the best garage cabinets you can buy spanning many different sizes. To learn more about the different materials for garage cabinets I recommend reading this post which is geared towards homeowners. When it comes to home storage there’s no better brand than Sterilite. Their multicolored Sterilite 01423V01 4 Shelf Cabinet is made of sturdy plastic and has a modern design aesthetic. Yet not everyone cares how shelving looks, but rather how it performs. And this unit performs very well offering 5 total shelves, 4 of which are adjustable. It measures about 70″ tall which should be just about 5 ¾ feet high. It’s a pretty tall cabinet but as long as your garage ceiling is 6.5′ or taller you should be good. You can pick between a dark gray(almost matte black) and a white platinum color. Both have the same build and style so this can match pretty much any garage. Because it has such a simple design this could even work in your kitchen or storage room inside the house. But one thing to note is the strange handle design. It does not have a hole to reach your fingers into. Instead it uses a bar that you grip and pull to open. This means you can’t fit a traditional padlock onto the cabinet which may be a dealbreaker for some people. Aside from this weird handle grip the cabinet is flawless. It doesn’t weigh too much but it feels sturdy enough to keep plenty of stuff inside. I recommend placing heavier items closer to the bottom so this doesn’t get top-heavy. If you like the design and need a simple ~6 foot tall storage space with adjustable shelves then you’ll adore this cabinet. Strong plastic polypropylene resin holds this cabinet together in all seasons and works great in moisture-prone garages. 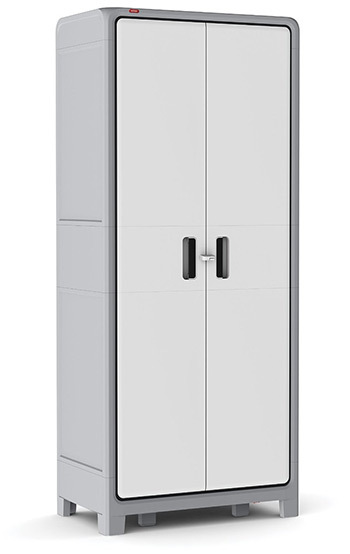 Keter’s Metro Storage Utility Cabinet is affordable, super tall, and designed with a neutral tone that matches well in any garage. It certainly won’t pretty up the room or draw much attention. But this cabinet holds 5 shelves with 4 being adjustable height. Each shelf can hold a max of 45 lbs which isn’t all that much, but it should be enough to hold extra household supplies and cleaning items. The strongest selling point here is the affordable price tag. Keter builds quality material but it’s not meant to be the strongest in the world. Instead this cabinet works best as a cheap solution for extra home storage. The removable shelves let you fill up the entire 67 inches(about 5.5 feet tall) with anything from mops to brooms or vacuums or anything else. You should not grab this cabinet expecting it to hold all your backyard mowing tools. Yes it can hold some items like trimmers or chainsaws that average 11 lbs, but you won’t have enough room to toss a bunch of heavy equipment in here. This is definitely a cheaper unit but that doesn’t mean it’s poorly built. Otherwise it wouldn’t be in this guide! Instead look at this cabinet as a budget option. The plastic build can hold quite a bit, however it’s not the strongest cabinet you can get so it’s really a budget pick for fiscally conservative homeowners. 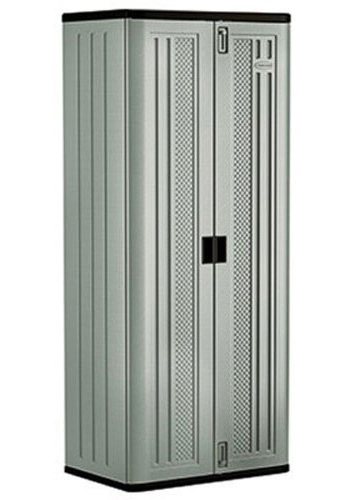 If sturdiness is a concern then look into the Gladiator GALG36KDYG cabinet made of heavy-duty steel. It comes with firm floor legs that look small but can handle a great deal of weight. The door latch is magnetized for easy opening/closing, and to keep the doors shut tight if they’re ever bumped. The doors also have a built-in key lock if you want to really secure it shut. This cabinet measures exactly 72″ tall(6 feet) but some of that height comes from the legs & the steel frame. I’d estimate closer to 5.7 feet inside the cabinet with 3 shelves. Each shelf can handle a load of 45-50 lbs. One neat thing about this cabinet is the optional Gladiator mounting kit which transforms this floor cabinet into a wall cabinet. You can get this hooked up in any garage and it offers a lot more space than you’d expect. I think this cabinet works great on the floor and it’s real sturdy. But some would rather have that wall-mounted setup which offers some versatility. One big downside is the lack of adjustability in the shelving. You can remove some of the shelves if you want more space inside, but you can’t choose where the shelves get placed. If you’re okay with fixed shelving then you’ll be more than pleased with this cabinet. The steel feels incredibly strong and should hold up in all conditions for all climates. 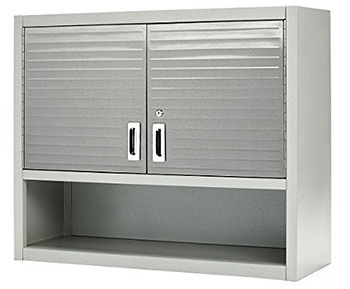 Another heavy-duty metal cabinet is the Seville UHD16234 Storage Cabinet. This comes on large casters so you can wheel it around and never need to worry about the weight. These wheels can be great for anyone who doesn’t like moving heavy furniture. But it also means you need to lock the wheels in place to keep it from rolling into your car. Also the wheels lift this cabinet higher which can look weird if your other garage items are flat on the ground. But the build is solid and it really feels like a garage storage unit. It has a key lock in the front, easy-grip handles, and very strong metallic doors to keep the contents inside safe from harm. Note you can set up this cabinet without the wheels but that seems counter-intuitive. They do make the unit more accessible and easier to move around as needed. Setup is a breeze and should not take very long to get together(maybe 1 hour at most). All 3 of the shelves are adjustable so you have your pick of deciding how to organize the ~6 foot tall interior. 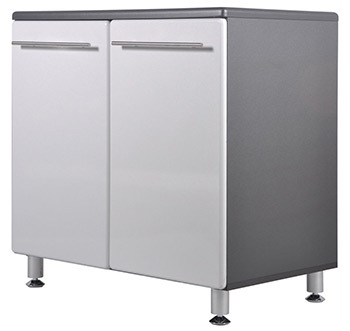 Very durable cabinet and perfect for anyone who wants a simpler experience moving the cabinet around. Wall-mounted cabinets free up floor space and still hold all your stuff just as well. 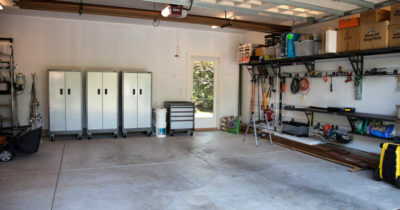 They may take a little more work to set up, but the end result is a clutter-free garage with much more space for anything you need. The Ulti-MATE Garage Wall Cabinet Set is beautiful to look at and super accessible. These cabinets only measure about 2 feet tall so you should be able to find plenty of space on the wall. And with about 1 foot in depth they can store a good amount of stuff from extra home supplies to that excess junk you’ll eventually sell in a yard sale. Each cabinet has one shelf in the middle that’s adjustable and one at the bottom. This means you basically have 6 shelves, 3 of which are adjustable to different heights. They’re made of pressboard so definitely not the toughest material but they can hold a max weight close to 100 lbs. All the cabinet doors and exterior walls are made of MDF which is much stronger, but still not as good as real wood. MDF stands for Medium-density fibreboard which is basically a bunch of wood fibers mixed together with wax/resin. It is surprisingly sturdy and it’s used in a lot of home furniture. However one thing about MDF is that it should not get wet. It won’t necessarily break the cabinets, but MDF can swell with lots of moisture and expand over time, thus weakening the boards. But even if you live in a wintery region you shouldn’t worry so long as these cabinets aren’t getting pounded with snow & rain. If they rest against a clean dry area in your garage they should be fine. The exterior finish is beautiful, the handles are well-designed, and these cabinets should be easy to mount with maybe 1-2 hours of work. And with a 1′ x 2′ average interior for each cabinet you’ll have plenty of newfound space in your garage. Seville has their own brand of wall-mounted storage called the Seville Classics UltraHD Wall Cabinet. 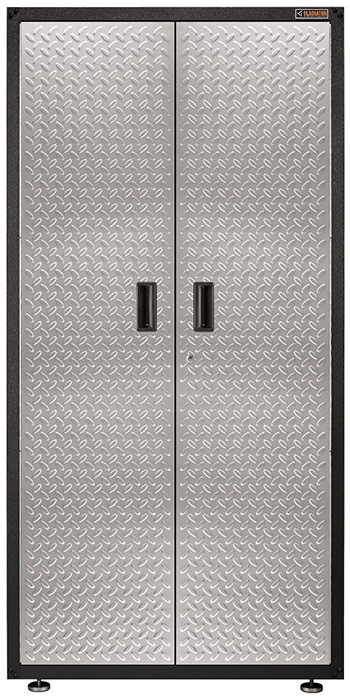 With a granite body and fingerprint-proof steel doors you get a beautiful outside with a sturdy base. The unit measures a full 3 feet wide and 2.5 feet tall so it does take up a good deal of space. But it can handle leaks and extreme cold well so it can be mounted on any wall at any position. It comes with a lock on the front which closes both doors together. This way you can lock your cabinet shut tight and never worry about anything falling out or going missing. In total this shelving unit has a max capacity of 350 lbs which is pretty darn heavy. Since it only has about 3 feet of space it won’t be able to hold much anyway. But it’s definitely a heavy-duty option that blends nicely with the wheeled Seville cabinet. Assembly is super easy and shouldn’t take more than an hour. This unit comes with a rail for mounting on the wall to keep the cabinet secure and stationary. And once you get this into the wall it’s not very hard to take it down and move around as needed. You could even use this cabinet for space in your pantry or mudroom if you don’t mind the shiny steel doors. 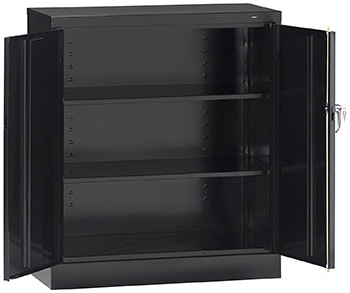 One of the strongest steel shelving units you’ll find is the Suncast Tall Storage Cabinet. It measures 6 feet tall and comes with 3 rock-hard shelves that are built to resist any bending. A very common issue with traditional shelving is bending under heavy weight. Once shelves start to bend they typically can’t bend back. However with this Suncast cabinet you can add weight up to 75 lbs or more and still not get any significant bend. This is because of the metal reinforced shelves that resist any bend even under heavy weight. It’s not a good idea to push the weight limit too far, but generally speaking you can get by with a lot of pressure on these shelves. Each door has a small handle and they’re both located right beside each other. You can buy a small padlock to keep the doors closed for extra security, but this cabinet does not come with a built-in lock. Assembly is quick and shouldn’t take more than one hour to complete. The doors are sealed tight and there aren’t any major holes to risk water or dust getting inside. This cabinet fits well with any garage, shed, or workspace where you want some gravity-resistant shelving. 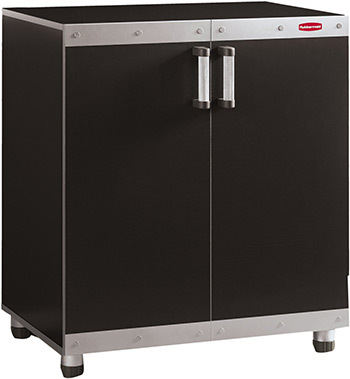 For a smaller garage storage chest you might look into this Rubbermaid FastTrack FG5M1300CSLRK Cabinet. It’s designed as a base cabinet so it is fairly small(only 3 feet high) and comes with 2 shelves, one at the bottom and one in the middle. Because of the size it’s very easy to assemble and even easier to use. The bottom feet are adjustable if you want to slightly raise or lower the height by a few inches. The exterior uses steel metal plates with a hard-coated finish which is weather resistant. This includes being scratch resistant and water resistant so it should hold up for years to come. You can fit a max weight of 150 lbs inside the cabinet, a limit that you’ll probably never hit. And you can add even more stuff on top of the cabinet using it like a shelf or table. Perhaps the biggest downside here is the lack of space. The unit is only 3 feet tall and it’s maybe 2.5 feet wide. This certainly isn’t the smallest cabinet you’ll find but it can only fit so much. This Rubbermaid cabinet offers everything most people want from a waterproof coating to optional wall mounting pieces. But given the small-ish interior you might consider investing in 2 of these cabinets just for good measure. Another smaller standing floor shelf is the Tennsco 4218 Cabinet which measures a bit taller at 42″. This comes with 2 adjustable shelves and a 3rd at the very bottom of the unit, ultimately offering a good amount of shelving for a 3.5 foot tall cabinet. All four colors have the same build and use the same material. Each shelf is also made of a strong steel design with a max capacity of 200 lbs! That’s incredibly strong and should hold everything you could possibly need. Plus the two inner shelves are adjustable so they can be moved around to manage the interior space. This cabinet has 3 feet in both directions long and wide so there’s a good amount of space inside. You can even choose to remove one(or both) of the shelves to make room for larger items. Everything inside can be secured with the door lock. Plus you can use this as a mini-shelf if you want to keep anything on top. Overall I’m a fan of Tennsco and I’d say this is one of their best smaller-form cabinets. Cabinets from Prepac are made from top quality materials right in North America and they’re built to last. That’s why the Prepac Elite 32″ Storage Cabinet offers a solid choice for garage storage without all the fancy features. This is made of a composite MDF wood blend which means it won’t have the solid feeling of a steel cabinet. The exterior has a laminate white finish which shouldn’t peel or chip in cold or warm weather. However it can chip from normal use and that’s a pretty likely scenario if this gets placed in a foot-heavy area of your garage. Prepac includes a 5 year limited warranty with this cabinet so you have some security from the manufacturer. It ships in pieces but assembly is quick and should average about 30 minutes. Each cabinet has 3 internal shelves and a bottom base for a total of 4 shelves. But the center shelf is fixed so you can only adjust the shelves above & below this center piece. These adjustable shelves have pre-drilled peg holes so you can increase or decrease that space by about 6″ on either side. In total the cabinet measures about 5.5 feet tall which is a good size. Prepac also sells topper wall units that work with this storage cabinet as a whole set. This can get expensive fast but it’s also the nicest garage storage set with matching colors and an MDF build. Each door has one thin metal handle that’s easy to grip. The doors aren’t too heavy so they open & close without much effort. The whole cabinet is simply fantastic and it’s the perfect solution for a minimalist decorator. 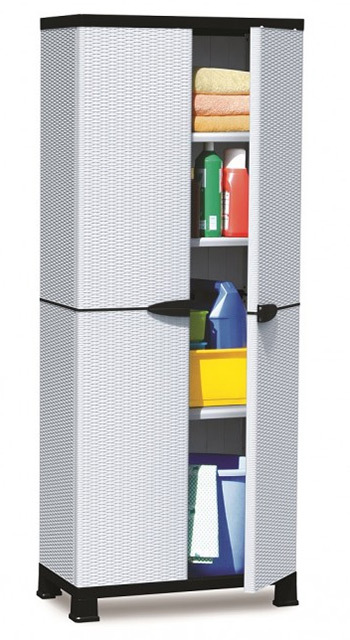 Another fantastic unit is the Plascoline Madera 3-Shelf Utility Cabinet made of a sturdy plastic material. This measures about 5.5 feet tall and includes 3 adjustable shelves with one at the very bottom. The feet on this cabinet can look a little thin at first glance. But the base is strong and it remains sturdy even with all four shelves packed full. Just make sure you keep the heavier stuff on the bottom to keep the center of gravity low. Each door has a latch to stay closed but they can both open pretty easily without much effort. The shelves are made of the same type of plastic and they come with a max weight of 44 lbs. The nice thing about this Plascoline shelf is the versatile design. It looks great in a garage but you could add one into your laundry room, furnished basement, or even your home office. The cabinet is designed to be simple so it can blend into any room in the house. 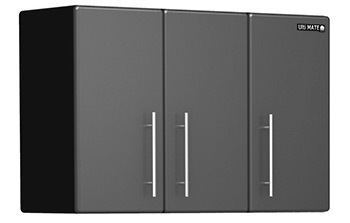 The Ulti-MATE Garage Base Storage Cabinet comes from the Ulti-MATE team who produce incredible cabinetry & cabinet sets. 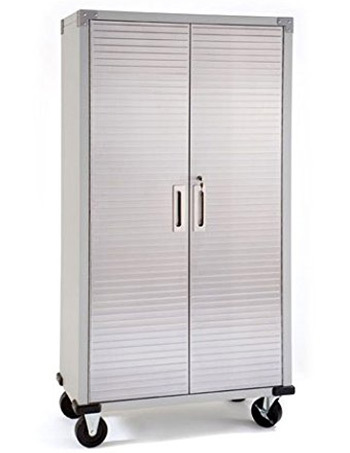 This base cabinet uses many different materials mixed into the design including a PVC/plastic laminate on the exterior to protect from weathering. This also makes it mostly waterproof so you don’t have to worry about keeping this in the garage over the winter. At the very bottom you’ll find 4″ feet which are adjustable for uneven flooring. These feet are strong enough to hold up in any weather and they can handle the cabinet’s max weight of 300 lbs. Each shelf can hold about 100 lbs and you can add items on top as well. The inner shelves use a mix of the PVC laminate along with MDF construction. They all have the same paint job as the exterior which mixes a lighter gray and darker gray together. 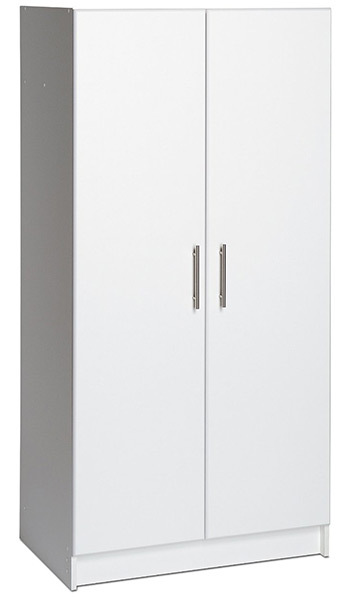 If you like the contemporary style of this cabinet you could make room for it in your office or kitchen. This was designed for garage storage but the modern style means it can blend into any room in the house. For affordable garage shelving that can handle plenty of weight you’ll want the Keter Optima Wonder Cabinet. It’s a strong plastic storage cabinet measuring 6 feet tall with 4 adjustable shelves. The plastic material is firm enough to keep everything steady but not so firm as to weigh down the unit. It only weighs about 50 lbs which is incredibly light considering the alternatives. Plus each shelf can withstand a max weight capacity of about 66 lbs which is much higher than most cabinets of this size. You’d expect it to cost a pretty penny but the Keter is definitely on the cheaper side of the spectrum. One bad part of this cabinet is the detailed assembly process. For whatever reason it doesn’t have a great manual and the steps can be tough to work through. It’s not a heavy cabinet but it does have a lot of very long pieces, and these can be awkward to put together by yourself. If you know your way around a tool bag you’ll have no trouble with assembly. Even someone who isn’t very handy can get this set up, it’ll just take more time. But the biggest downside of this cabinet is the weird stabilizing pole that runs right through the cabinet splitting the shelves about 70% of their width. You can reach around this piece but it just feels clumsy and in the way. For the price you really couldn’t ask for much more. The assembly isn’t super easy and the divider is definitely a strange annoyance. But if you can look past that you’ll get plenty of value from this cabinet over the years. Out of all these cabinets with so many diverse styles it’s tough to pick a #1. But in my opinion the Suncast Storage Cabinet is the best choice that should fit well in anyone’s garage offering plenty of space and stability. Suncast even has a mega tall version of the cabinet that’s almost a foot wider and 8″ taller. But you might prefer a wall-mounted option to save floor space. If that’s the case look into these partitioned cabinets by Ulti-MATE. They’re built with MDF so they’ll have to be in a dry garage. But they come with a sleek design and fit with other Ulti-MATE cabinets if you ever need more storage. There is no single best garage cabinet other than whatever suits your needs. Take another look over this guide and if any particular cabinets draw your attention be sure to check ‘em out.